Do mosquitoes have any benefits to humans or the world at all? We all know that mosquitoes are usually equal to bad news. Or at least, we suppose they are bad for us. But maybe these insects do have some type of beneficial effect on the planet. So does this disease-spreading, irritating insect have a positive side, too? After all, nothing is completely bad at all times. Perhaps mosquitoes just suffer from bad press… This article looks at ten benefits mosquitoes bring to people and to the planet, and believe me, it wasn’t easy to find ten of them! Mosquitoes have been on this planet for around one hundred million years. There are more than 3,500 different species of mosquito. They are one of the planet’s biggest success stories. Where humans, are concerned, mosquitoes are best known for their ability to bite and spread disease. But the number of mosquito species that actually bite humans are quite small. It’s not so easy for someone covered with itchy bumps to believe that, I know. But it’s true. And what is even more difficult to believe is that mosquitoes have their benefits. This is probably the most obvious benefit mosquitoes bring to the planet. With millions upon millions of mosquitoes populating the earth, it goes without saying that something eats them. Mosquitoes are packed with protein and can be found in huge swarms. They can provide a large meal or a tiny snack. Mosquito larvae are always hungry. They emerge from eggs laid by female mosquitoes in stagnant pools of water, and can even thrive in moist soil. As long is it is in water, a mosquito egg will develop into a mosquito larva. In a single acre of soggy land, you might find a million eggs. The eggs hatch into larvae. Larvae develop into adult mosquitoes within a week to ten days. During this time, all they do is eat. Mosquito larvae eat algae, parasites, fungus, and other microorganisms. And they eat all the time. This means that mosquito larvae can get through a lot of ‘detritus’ (or biological waste) in just a few days. So top points for mosquito larvae as natural waste removers! Mosquito larvae produce frass. Frass is what those in the know call insect poop. Millions of mosquito larvae eat detritus and then poop it out into the water. This water might not be a great source of nutrients for us, but for plants it’s perfect. Insect poop is very nutritious. And all of the nutrients are instantly dissolved in water when they are excreted – or pooped – out. This means a plant does not have to work very hard to absorb the nutrients into its root system. Frass stimulates plants to bloom and provides essential ingredients for plant growth and health. In short, frass is compost. Nothing makes a plant happier than insect poop. Repelling insects is an entire industry on its own. That includes this blog, which partially covers my monthly bills. The many types of products produced to keep those nasty creatures away from us (and our loved ones) is a multi-million dollar worldwide industry. They actually add to the global GDP because of that! If you only look at the many different repellents and bite treatment products available out there, you quickly realize the impact these creatures can have on the global economy. Now to be fair, the negative effect of mosquitoes on the global economy is much greater. That is mainly attributed to deadly diseases they carry around, from malaria to the infamous zika virus. Yes. You understood that right. Mosquitoes are making an impact in the world of engineering. Very recently, filming equipment was developed that slowed mosquito flight right down. Engineers were able to see every tiny mosquito wing movement. Why would they want to do that? Now be honest. How many times do you actually notice that a mosquito has landed on your skin? Can you feel it leave your skin when it flies away? Probably not. The combination of mosquito leg movement, wing movement, and wing speed is now being studied by top engineers. The plan is to develop drones that won’t disturb their surroundings when taking off or landing. Just like the mosquito. The things we can learn from the natural world are truly limitless. I’ve already mentioned that only a few species of adult (female) mosquito feeds on blood. The majority of them are quite happy with sugar. The most common sugar source in the natural world is nectar. Plants produce nectar for one purpose – to attract insects and birds. In return, nectar eaters brush against the flower’s sexual organs and pick up or transfer pollen. With millions of nectar-loving mosquitoes spread all over the globe, they help plants to spread. They also help to increase plant diversity. Mosquitoes even do this in the Arctic, where insect populations are much more limited. Arctic mosquitoes not only drive the local caribou’s crazy, they also play a very important role in indigenous plant pollination. What if we could eliminate the biting mosquitoes but keep the nectar-eating ones? Perhaps you are starting to see that mosquitoes have their uses. Maybe we shouldn’t be looking for a way to get rid of them all. Just getting rid of the ‘bad guys’ might be the best thing to do. But how do you just get rid of bad mosquitoes? By bad, I mean the dangerous, disease-carrying ones. Chemicals like DDT are certainly not the way to go. Toxic chemicals kill all insects. These poisoned insects are then eaten by birds and fish. We eat birds and fish. So this isn’t the right solution. What is more, mosquitoes quickly become resistant to strong chemicals. Scientists are now looking into using genetically modified mosquitoes to make whole populations sterile. But we might not need to get help from the scientists. There are nectar-loving mosquitoes that kill other species of mosquito. Or rather, predatory mosquito larvae that eat the larvae of other species. Like Toxorhynchites mosquitoes, for example. 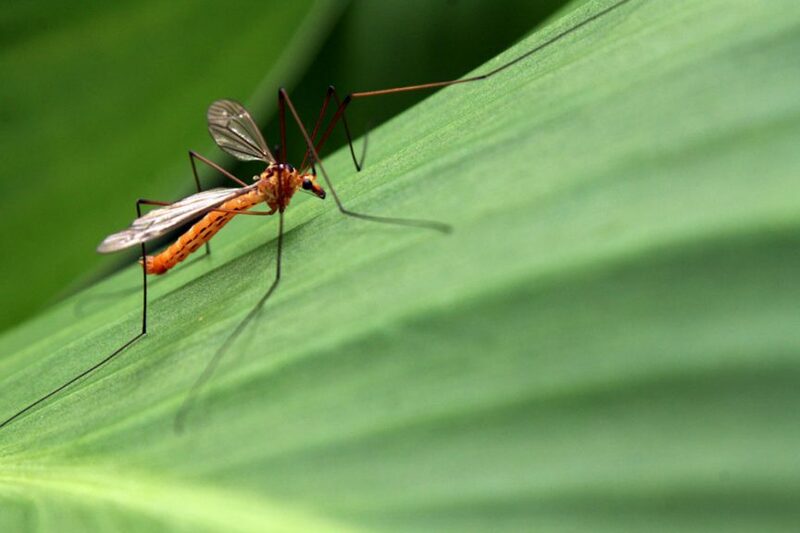 This mosquito species is also called the ‘mosquito eater’. In other words, ‘good’ mosquitoes can be used as biocontrol agents against ‘bad’ mosquitoes. That way, no-one needs to be genetically modified. Nothing says ‘Keep Out’ quite like a swarm of mosquitoes! Mosquito breeding grounds are usually the last places we humans like to build houses in, work in, or spend our holidays in. And bearing in mind the state of the planet, this is a definite mosquito benefit. Very large areas of the tropical rainforest are completely uninhabitable thanks to our pesky ‘friend’. This means the important biodiversity of the rainforest is protected by one of the tiniest creatures on earth. And this benefit isn’t limited to Central and South America. Caribou herds are so irritated by the huge swarms of mosquitoes on the Arctic tundra that they change their migratory route. When they change their route, they leave plant life to grow and spread for another season. Mosquitoes are not just a human and animal deterrent. They are protectors of natural habitats, and plants and trees. Scientists don’t only search for ways to eradicate disease-carrying mosquito species. They also research into mosquito anatomy and physiology. Many people think that the reason we stay asleep when a mosquito bites is due to anesthetic chemicals in her saliva. This doesn’t seem to be true. It is the saw-like edge of the mosquito proboscis that slips painlessly into our skin like a knife through butter. Studies look at the mosquito proboscis, with the aim of designing a painless needle. At last! Actually, the chemicals in mosquito saliva are important for a different reason. 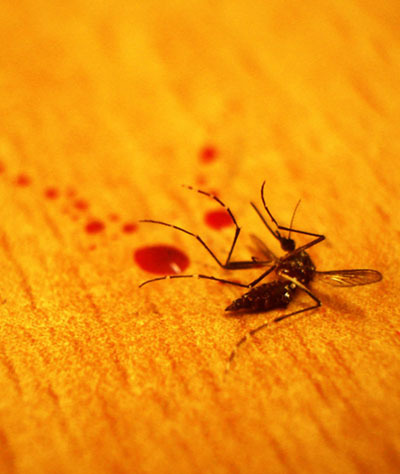 Chemicals in mosquito saliva stop our blood from clotting. Thanks to mosquitoes, we might soon have new anti-clotting drugs. These drugs decrease the risk of heart attacks and strokes. There is even research going on into the possibility of turning mosquitoes into living vaccines. Us humans have made a lot of mistakes when it comes to mosquito control. In the mid-nineteenth century, the United States used ‘Paris Green’ to eradicate mosquitoes. Paris Green spray contained large amounts of arsenic. It burned trees. It slowly killed us. So humans began to look for an alternative. In 1939 a Swiss chemist named Paul Müller discovered that dichlorodiphenyltrichloroethane, or DDT, killed insects. But by the 1960s we had realized this chemical was very harmful. It poisoned animals, plants, crops, water, ourselves, and our natural habitat. It wasn’t until 1994 that DDT was banned. The next move was to produce a less harmful mosquito killer, which we called permethrin. But mosquitoes, as we all know, are tough cookies. So mosquitoes have also taught us something else: the pesticide treadmill. This tells us that mosquitoes become immune to chemicals that would usually kill them. And it doesn’t take long for them to become immune, either. Point nine in the list of ten mosquito benefits might seem like a strange point to make, but it is a good one. We have caused so much damage to the earth and to ourselves in our fight against mosquitoes. But we are learning from our mistakes. Mosquitoes indirectly help us look for more natural, less toxic ways of pest control. I know what you’re saying. “You’ve already said that!”. Yes. You’re right. I did. But I think I should be more clear. Point ten is the benefit of mosquitoes as a food source … for you and me. I know you’re making a face. I must admit, I don’t like the idea of eating mosquito soup, mosquito cake, or anything mosquito for that matter. But I also know you have heard about fried insects and chocolate-covered ants. Anyone on holiday in Thailand can crunch on a deep-fried tarantula or lick a grasshopper-lolly. And eating insects is not just a novelty or a fad. Just look up ‘insect flour’ on Google and see for yourself. Insects are becoming an increasingly acceptable source of food for humans. Especially with all the worries about whether our planet can provide food for us all. So why not eat mosquitoes? I’m not making this up, by the way. So, Are Mosquitoes Really Our Friends? Mosquitoes still have a long way to go before becoming our friends. They have a bad reputation which has lasted for millennia. I doubt this article will do much to change that. No-one wants to be bitten, and no-one wants to catch a mosquito-carried disease. But I hope these ten benefits of mosquitoes gives you plenty of food for thought. They should make you think a little bit about the mosquito’s more positive side. You might not be convinced about the benefits of mosquitoes. If not, you will find plenty of ideas for ecologically-friendly and effective mosquito control on my anti-mosquito tests and reviews.